ABOARD THE AMPHIBIOUS ASSAULT SHIP WASP — Greetings from the Atlantic Ocean, where we’re covering the largest amphibious exercise on the East Coast since the beginning of the Iraq war. Bold Alligator 2012 involves at least 14,000 personnel from the U.S., France, Great Britain and other countries, and at least 25 ships. The majority of them are American, but Canada and France have both chipped in with their own hardware, as well. Conceptually, the forces at sea are currently in the early stages of planning an attack on enemy forces from the fictional country of Garnet, a common enemy in what military officers call the “Treasure Coast” scenario. A mechanized Garnetian division has invaded the neighboring country of Amber, and is pushing north toward Amberland, which has asked for coalition assistance to stop advance. Garnet already has mined several harbors and established anti-ship missiles on the coastline, military officials said. In reality, Bold Alligator will require naval officers to think on their feet to develop strategy and defeat their fictional enemy. They’ll be tested on how they do, and be forced to adapt to real-world changes ranging from scheduling mishaps to bad weather. An amphibious raid will be launched from several ships and coordinated from the Wasp over the next couple of days. Exploring the ship, it’s clear that many of the Marines on board have been to sea only a few times until Bold Alligator, if ever. For example, Sgt. Michael McDaniel told me that he deployed with 2nd Assault Amphibian Battalion, out of Camp Lejeune, N.C., to Iraq for both the initial push to Baghdad in 2003 and urban combat in Fallujah in 2004-05. He’s still with the unit, and has never participated in an amphibious exercise on this scale. Bold Alligator has significant attention from some of the top officers in the Navy and Marine Corps. On board Saturday was Adm. Jonathan Greenert, the chief of naval operations; Gen. Joseph Dunford, the assistant commandant of the Marine Corps; Lt. Gen. John Paxton, commanding general of II Marine Expeditionary Force; and Lt. Gen. Dennis Hejlik, commander of Marine Corps Forces Command; and Vice Adm. David Buss, deputy commander of Fleet Forces Command. 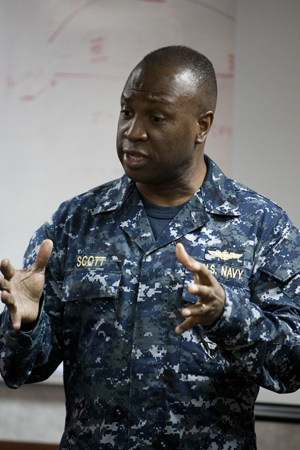 That’s in addition to Rear Adm. Kevin Scott and Brig. Gen. Christopher Owens, who are leading the exercise from the Wasp. The exercise also has attracted attention in Congress. At least four members of the House were here Saturday, including Rep. Buck McKeon, R.-Calif., chairman of the House Armed Services Committee. To the extent possible, photographer Mike Morones and I will keep posting updates from the exercise, which we’ll be covering for the next several days. As you might expect at sea, Internet service has been spotty. However, a “Super Bowl Bash” is listed on the ship’s plan of the day Sunday. As a Massachusetts native and Patriots fan, that suits me just fine.